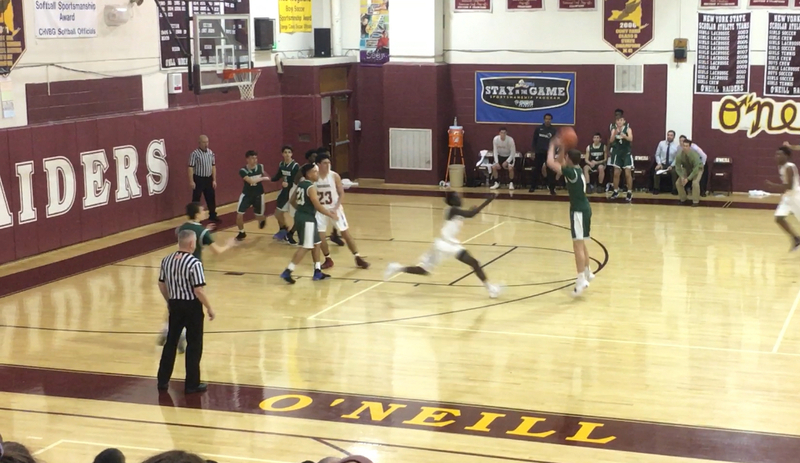 HIGHLAND FALLS — Earlier this week, O’Neill senior guard Tony Njoga found himself in familiar territory for most sharpshooters. While most of his underclassmen teammates had regents testing throughout the week, Njoga didn’t. He used that time wisely by getting shots up in the Raider gymnasium nearly every day throughout the week. His dedication paid off, leading James I. O’Neill (10-2) with 17 points in a 58-53 win over Minisink Valley (7-6). He shot 4-of-7 on three-pointers, three of which came in the first quarter. He added that senior night also gave him a pretty big momentum boost. O’Neill led 22-8 after a 16-0 run in the last 5:03 of the first quarter. They only led 29-25 at halftime after being outscored 17-7 in the second quarter. Neck-and-neck throughout the second half, the Warriors took their first lead in the game with 2:37 left. With 58 seconds left, O’Neill junior guard Darius Boben made an and-one layup to give the Raiders a 56-53 lead. After two timeouts from Minisink Valley head coach Matt Caputo, the Warriors turned the ball over with 12 seconds left. On the inbounds pass, they fouled senior guard Fred Hendrix, who made both free throws, sealing the game. O’Neill head coach Debra Crowe knew 6-foot-3 junior guard John Mack was going to be a challenge for the Raiders. The Warriors were previously 5-0 since Mack returned from a broken collarbone three weeks ago. Mack finished with 16 points on 7-of-24 shooting, 14 rebounds, and five assists. It’s been a similar type of season for both Minisink Valley & O’Neill. The Raiders started the season 1-2 and have won nine straight games. The Warriors started off the season 2-5, and won five straight before tonight’s loss. “We’re playing some really great ball right now,” added Crowe. “We’ve got a great group of young men who are an absolute pleasure to coach. When someone is having an off night they pick each other up and feed off each other’s energy.